Welcome to Copa Hostel, where you can live magical moments in the most new and modern hostel of the city of Rio de Janeiro. Here you'll find everything that a tourist needs to enjoy your trip as simply and as comfortable as possible; this, without losing the beauty of being in one of the most beautiful places on the planet. We also have the brilliant Cyber Cafe and a pub! All rooms are equipped with air conditioning and fans - an essential luxury for a city of tropical climate. Still more when it's summer! Each dorm bed has a locker of amazing dimensions. It's not surprising to hear from guests how valuable and safe it is to have a locker of so great dimensions. 'Inside of them my entire luggage fits', a Swedish guest said. In the main building there are 11 rooms, with four bathrooms and an exclusive kitchen for the guests. 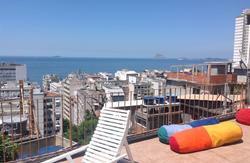 On the terrace is a swimming pool, barbecue and ample area for more than 100 people to feel a little of the Carioca heat. There's laundry facilities, hot water in all the showers and exchange of linen upon request. We're situated in the quarter of Copacabana, with easy access to the beach of Copacabana - the most famous beach in Brazil. In front to the Copa Hostel are bus lines heading to any point of the city; we're also close to the Cantagalo subway station. It's not difficult to find us - we're the orange building at the corner of Av. N. S. Copacabana and Djalma Ulrich. Our cyber cafe is equipped with seven high-tech computers. In reception you can receive personal support for any software. Also we offer all types of stationery service, like copying, scanning, faxing and more. As we do not intend that you feel alone in our rooms, we have very lively and friendly staff and two telephone cabins where you can get in contact with friends and family back home. We serve varied types of frozen and hot drinks in the cafe such as sodas, water, iced tea, energy drinks, beer; coffee, cappuccino, hot chocolate and tea. Our pub, Guimos, is open from 1700 to 0300, with a sophisticated and delicious menu. We serve sandwiches, burgers of picanha, salads, roast potatoes and the most succulent desserts. It's a delicious tour! When we're looking for a bar, we look for fun, music and special drinks. Our pub is down just one flight of stairs so you don't need to be worried about coming back late to the hostel. One of the great advantages of the bar! There's also a big-screen TV showing sports, music videos and more. We also offer a professional pool table, Backgammon, chess and Jogo de Damas. 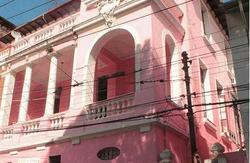 The best hostel of Rio de Janeiro is ready to receive people from any part of the world. In the reception the specialised attendance of the employees goes to make a great difference. The staff of the Copa Hostel is integrated by glad and intelligent people who are prepared to transmit all type of information regarding the tourism and the city, in English and Spanish. In our team we have professional tourist guides (Embratur registered). We can facilitate visits to all the tourist points of the city, with ecological, radical, religious strolls, Samba parties, Sugar Loaf, Corcovado, wild beaches, boat tours. And everything that you can imagine we will happily find out for you. We are in Copacabana neighborhood, just one block from the beach. You're gonna find us easily at the corner of Djalma Ulrich Street and N.S. Copacabana Avenue. 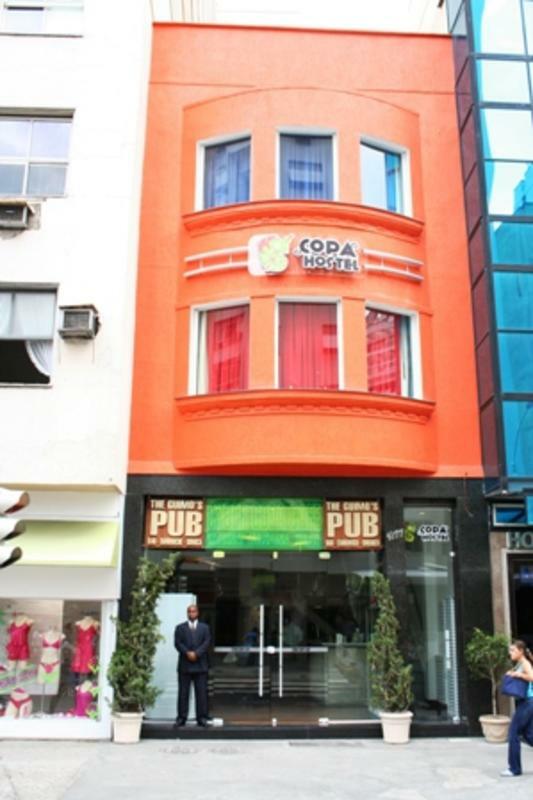 This is an orange building that has a cyber cafe at the first floor and a pub at the back. 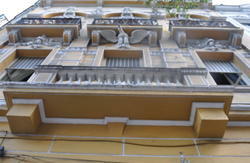 The second, third and fourth floors are the Copa Hostel.